Mar 19, 2002 New from Transducer Techniques an economically priced System combination comprising of our popular LPU (Low Profile Universal Load Cell) and our DPM-3 Panel Mount Meter. This system is suitable for a variety of industrial and OEM force measurement and weighing applications. The DPM-3 can be scaled to a full five digits / samples 60 readings per second / analog output and true peak reading capability. The LPU is a tension or compression Load Cell offered in 14 ranges from 100 LBS. to 50K LBS. Hold down is via outside diameter counter bored thru holes, and loading is thru center at either end. Accuracies are consistent with highly accurate strain gage based load cells. 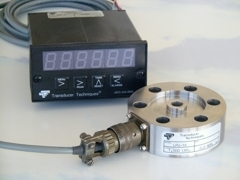 LPU/DPM-3 system includes LPU Low Profile Universal Load Cell and DPM-3 panel-mount meter.